At the insistence of my six-year-old daughter we took a much needed stroll around the neighborhood. And while engaged in a discussion about a magical, fuchsia and lavender-colored, flying horse named Princess Celestia (see earlier entry), I spotted this. 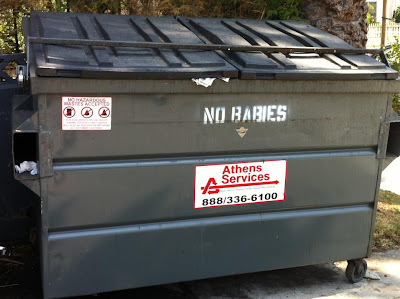 This made me wonder what would prompt someone to stencil this rather bothersome decree on their dumpster. Might there be a grizzly history attached to this dumpster? Might it simply be a warning because of past grizzly events? Or might it simply be a random tagging by a conscientious Crip?